It’s just 36 days until TO2015 – the Toronto 2015 Pan Am & Parapan Am Games. After years of sacrifice and determination in the relentless quest to compete among the world’s best, Canada’s athletes will vie for gold and glory on home soil – a once-in-a-lifetime opportunity. 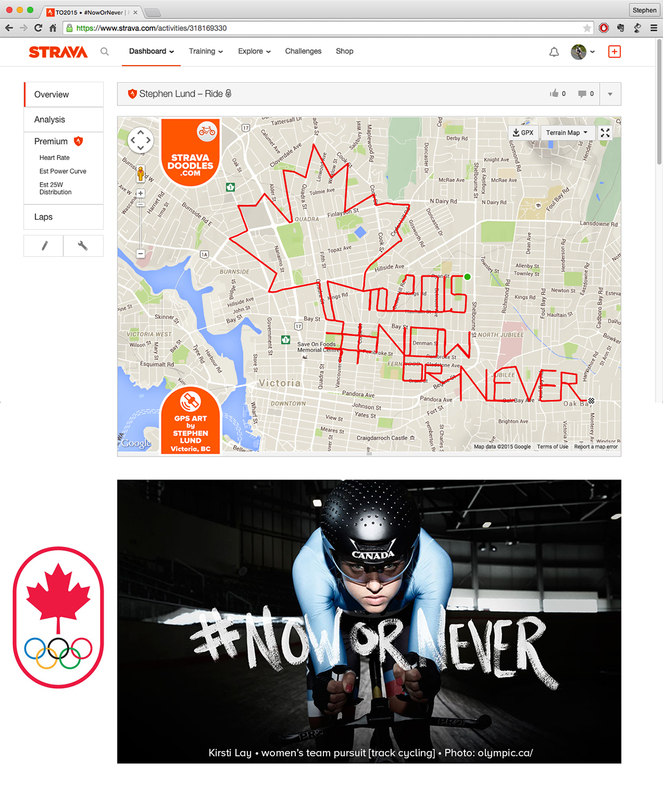 The #NowOrNever campaign offers a glimpse into the athlete’s journey to the Pan Am Games beginning from the first jump off a diving platform, the first bike ride, the first gymnastics flip…. You can view the one-minute #NowOrNever video here. Hosting around 6,000 athletes from 41 countries in 36 sports, 51 disciplines and 365 events in and around Toronto, Ontario, TO2015 will be the largest multi-sport competition ever held in Canada. The 2015 Pan Am Games run from July 10 to 26. The Parapan Am Games take place from August 7 to 15. To create this doodle, I cycled around 50 kilometres. The vast majority of the lettering follows actual roads in Victoria, BC, as does more than half of the maple leaf’s outline. For the remainder, I had to “connect the dots” by turning my Garmin OFF and ON at carefully planned points. Brand strategist and creative director by day. Hyper-competitive GPS-art obsessed cyclist most of the rest of the time. This entry was posted in bike-writing, gps art and tagged #NowOrNever, athletes, bicycling, Canada, creativity, cycling, garmin, gps, gps art, Pan Am Games, Parapan Am Games, strava, strava art, Team Canada, TO2015, victoria bc. Bookmark the permalink.